The dramatic acceleration in the human enterprise and the impacts o the Earth system over the past century, with a synchronous acceleration of trends from the 1950s to the present day – over a single human lifetime – show little sign of abatement. 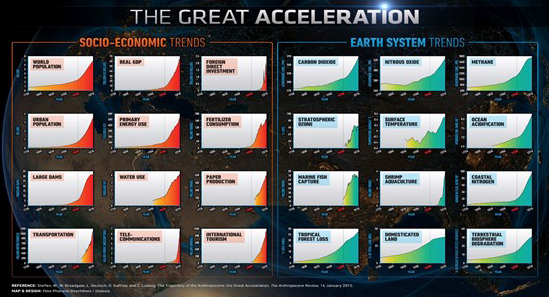 This “Great Acceleration” contributed to the proposal that Earth is now in the Anthropocene. The global targets set in 2015 by the Paris Agreement and the Sustainable Development Goals provide a framework to unite scientific disciplines to deliver search to address the urgent challenges of the Anthropocene. This talk will explore and invite participation in the activities of Future Earth – an international research program designed to deliver research outcomes to catalyse and accelerate the transformation to global sustainability.